There are growing moves to ban smoking in outdoor areas, including playgrounds, parks, public squares, and outside buildings such as hospitals or schools. Some of these bans are led by councils, others by health authorities or private owners. Outdoor smoking bans are rarely justified on health grounds, since smoking outdoors presents no harm to anyone aside from the smoker themselves. 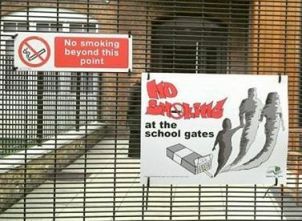 Instead, restrictions generally aim to ‘denormalise smoking’, to reduce children’s ‘exposure to smoking behaviours’ or to pressure smokers to give up. These are unacceptable interventions into public freedoms. Smoking is not illegal, nor is it illegal to smoke in front of your own or other people’s children. A public space should be for the free use of the associated members of the public, not for the state prescribing of individual morals. The Manifesto Club is researching and opposing outdoor smoking bans, in line with our other campaigns against the overregulation of public spaces. We are collaborating on this campaign with the smokers’ rights group Forest.